[TGTTGIT] recently took the plunge and decided to build his own computer using logic chips. He just completed a 4-bit ALU which can compute 18 functions. It took a long time to get the wiring right, but in true geek fashion his build was accompanied by an alternating Chapelle’s Show and Star Trek: TNG marathon playing in the background. This project is the stepping stone for a larger 16-bit version. The experience of wiring up just this much of it has convinced him that an FPGA is the only way to go for the future of the build. But since he had already ordered the chips it was decided that the only thing to do was to see this much through. He used the truth table from The Elements of Computing Systems for the design and posted several times about the project before arriving at this stopping point so you may be interested in clicking through the other post on his blog. There’s also a lot of other TTL computer projects around here worth checking into. The problem with trying to port a project like this to an FPGA is that if you make best use of the synthesis tools, the problem becomes trivial. If you use structural definitions in say VHDL, the software will probably do a bad job translating the structural definitions into effcient code. Once you have the paper design layed out, most of the fun is over. Indeed. 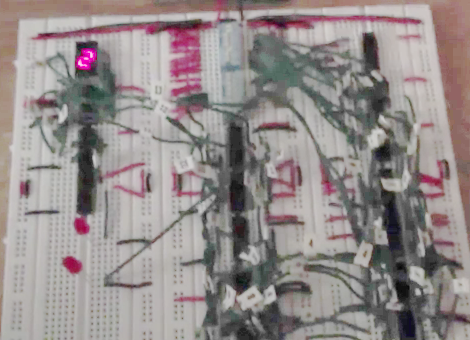 Having done this back in the day, I really appreciate programmable logic. Looks almost exactly like one of my term projects for CE, ‘cept mine was wire wrap. Just the other day I was doing a much simpler circuit with episodes of MacGyver running in the background. It’s actually a pretty neat way to multitask. Look it up on Google = 13,394. Thanks, Google!